Tom Brennan is the owner of Intervolt and asked me to capture a mix of portraits of him and his staff along with one of their vans. 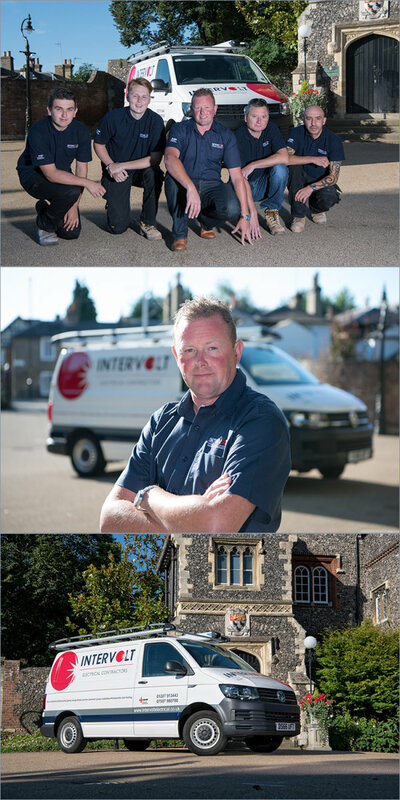 We used the picturesque setting of Tower House in Canterbury, set against the backdrop of the Westgate Gardens. On a bright early Summer morning I photographed against the Sun, using two Profoto lights, A1 and B1 to light up Tom and his staff. The finishes group photos set the team out from the background, I used a more shallow depth of field for the individual portraits combining the high speed sync facility of the Profoto lights to give a fast shutter and shallow aperture.